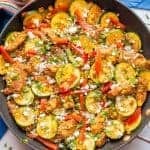 Queso chicken skillet with vegetables is an easy, delicious one-pot dinner the whole family will enjoy! 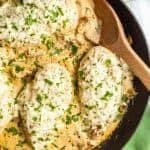 The Mexican spices flavor the tender chicken pieces and fresh veggies and the queso dip coats every bite with creamy, cheesy flavor. So I had jury duty yesterday and it was super interesting! I had loaded up my bag with work, expecting to sit in the jury waiting room all day like I did last time, but I was immediately called into the courtroom and sat in a jury box. After multiple hours of having the plaintiff’s side question us, I finally was dismissed because I have a trip coming up next week and this trial is expected to take a couple of weeks. I also knew one of the lawyers, so I’m sure I would have been dismissed for that too. I definitely dodged a bullet, but at the same time, I do kinda wish I could have seen it all play out. It’s a divorce proceeding for a Nascar driver and from the line of questioning, it sounds like a juicy one! (And I really do see it as an important civic duty.) Ah well… back to work for me! 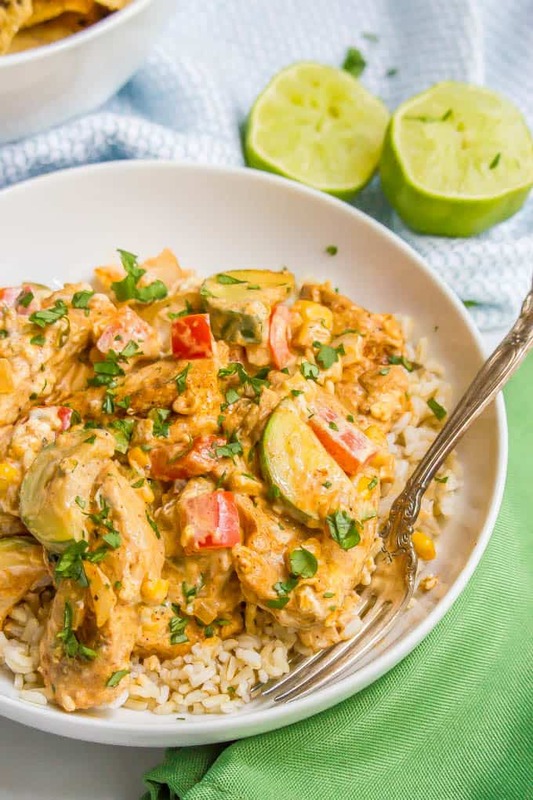 This queso chicken skillet with vegetables is a one-pot dinner that’s loaded with fresh summer vegetables, seasoned with Mexican spices and coated in a creamy, delicious queso dip. You’re going to be going back for bite after bite after bite. It’s kind-of irresistible! And then to take it totally over the top and create a cheesy, gooey sauce that coats the whole skillet, I add a delicious queso dip at the end. My now go-to is La Terra Fina’s Queso Cheese Dip, which makes this dish so easy. You just add the entire tub at the end to get it warmed through and bam! You are ready to dig in! I love this combo of vegetables but feel free to skip or substitute any of them if you aren’t a fan. I use a red bell pepper, but you could substitute a yellow or orange bell pepper. You could also use a mix of some of those mini sweet peppers instead. We love serving this over steamed brown rice. 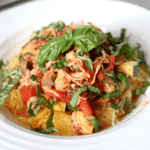 You could also serve it as is, with tortillas or with cauliflower rice for a low-carb option. 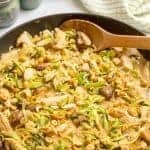 Or you could stir in some cooked pasta (and maybe a splash of the pasta cooking liquid) to make a queso chicken pasta dish. You could also set out a bowl of chips and just let everyone go to town! If you want to serve it that way, I’d suggest cutting the chicken and zucchini into a smaller dice, so it’s more scoop-able. You can also add some black beans to this to bulk this up. Don’t skip the fresh lime juice to finish this at the end. It brightens up the dish and helps cut the richness from the queso. Also, don’t forget to add your favorite toppings! 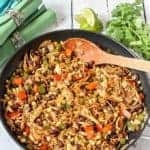 We love some fresh chopped cilantro on top of this queso chicken skillet with vegetables at a minimum. Some other ideas include diced avocado, some chopped fresh tomatoes or even some dollops of salsa. 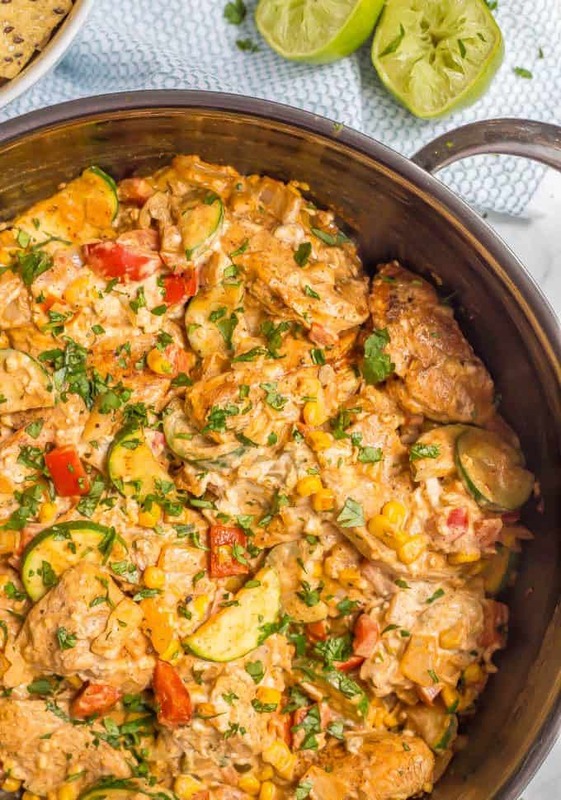 Your dinner table needs this queso chicken and veggie skillet for sure. It’s sure to earn you lots of smiles and high fives. Queso chicken skillet with vegetables is an easy, cheesy, delicious one-pot dinner the whole family will enjoy! For serving: chopped cilantro, sliced avocado, diced tomatoes, etc. Make the seasoning mixture. Combine all ingredients in a small bowl and stir to combine. Use a little more than half of the seasoning mixture to generously season the chicken pieces on both sides. Save the remaining mixture. Heat 2 teaspoons olive oil in a large skillet over medium high heat. Add the seasoned chicken and cook 7-8 minutes, turning once, until the chicken is cooked through. Remove to a plate and cover with aluminum foil to keep warm. Add the onion, zucchini, pepper and garlic and sauté over medium heat for 5-6 minutes, until the veggies are softened. Add the corn and stir to combine then season the veggies with the remaining seasoning mixture. Stir well. 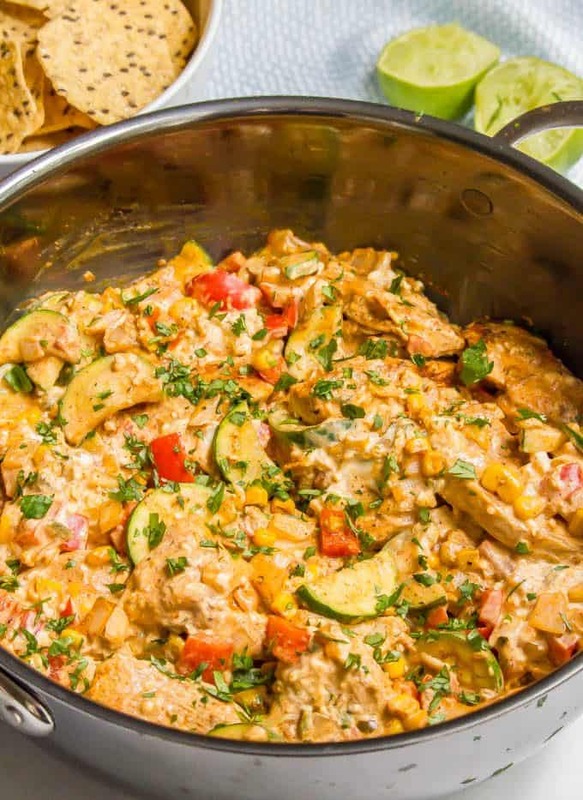 Return the chicken to pan (along with any accumulated juices) and add the entire container of queso dip. Stir well to warm everything through and get everything coated in the dip. Finish the dish with the fresh lime juice and serve hot with desired toppings. 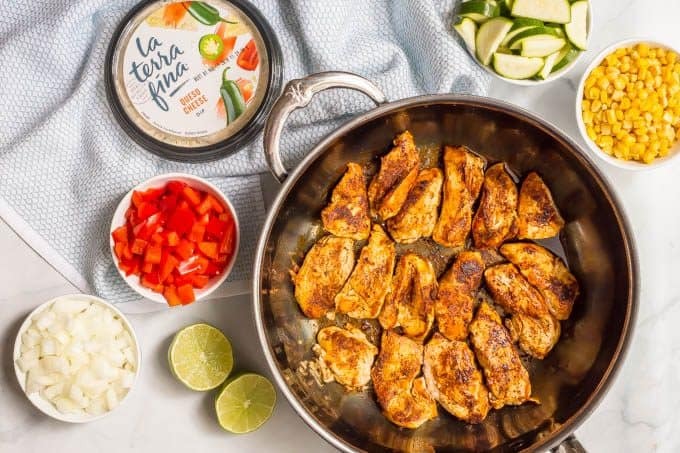 I use the La Terra Fina Queso Dip, which has just a touch of heat. However, if you want to go spicy, you could try this with La Terra Fina's Spicy Sriracha Three Cheese Dip. We love serving this over steamed brown rice. 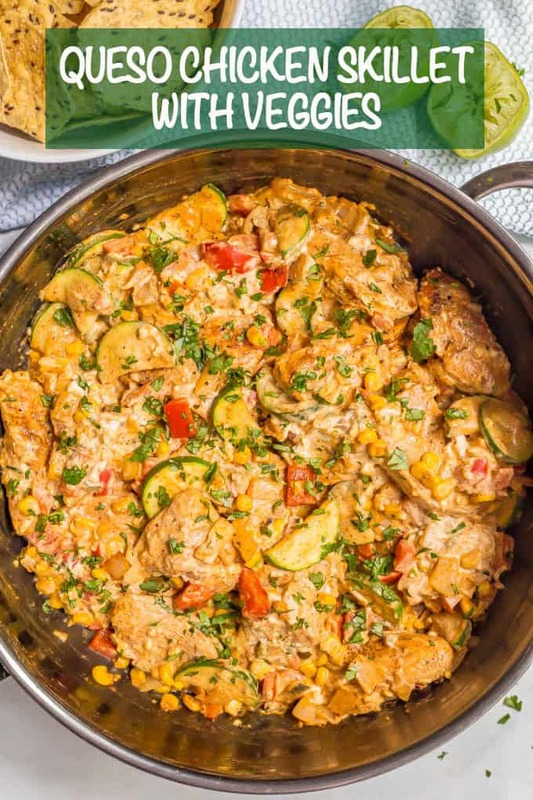 You could also serve it as is, with tortillas or with cauliflower rice for a low-carb option. You could also try it over pasta. Don’t forget to add your favorite toppings! Chopped fresh cilantro, diced avocado, chopped fresh tomatoes or even some dollops of salsa would all be great here. You had me at queso! 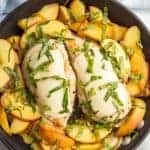 Yep, this recipe was made for me! Can’t wait to try it! The family will love it too! Can’t go wrong with queso! And this La Terra Fina one is really delicious. 😊 Hope you love this dish! Made this Friday night for some friends and we ate the whole thing! Served it over brown rice. Heavenly!